I highly recommend Tracks & Sign of Insects and Other Invertebrates. I find that it’s one of my most used references of late. If you already have it, you’ll find the answer to this challenge in it. Tussock moth cocoon? 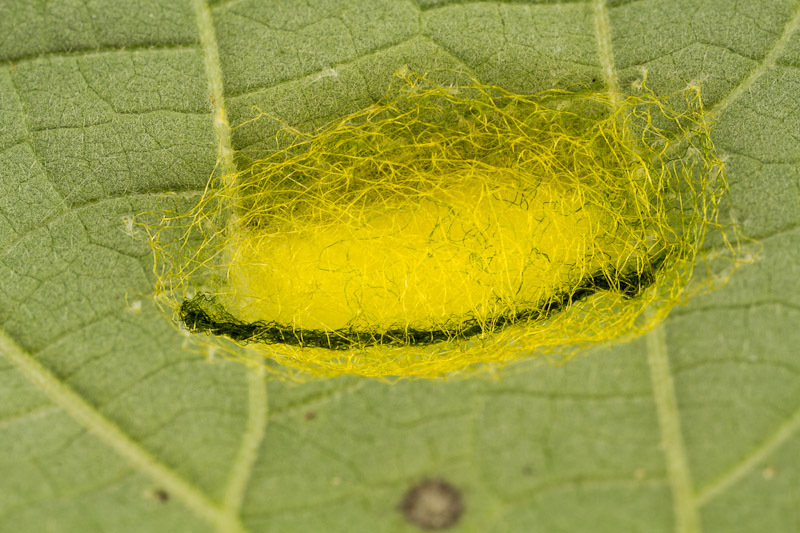 Something yellow with a black stripe down the back that used its own fuzz to spin its cocoon? My first thought was along those lines as well. In fact, I brought it home planning to see what moth would emerge. As it turns out, that’s not even the right class. Hmm. Well, there’s some spiders that will build a egg case and camo net from yellow silk – the black line is new to me, though. OK, what is it? They are all over my porch ceiling. I didn’t powerwash them this weekend.